Why are so many people ADDICTED to this chocolate-hazelnut spread? Well, addiction can be exactly what's happening. Read the breakdown of some nutella ingredients way down below, after the recipe. - First thing to do is to roast the 2 cups of hazelnuts until they're dark brown. Preheat oven to 375°F. Spread the hazelnuts out as a single layer, on a rimmed baking sheet, and roast about 12 to 15 minutes. Rotate the baking sheet halfway through this time. WATCH them closely, as they can go from perfect to burnt if you step away for too long. - Transfer the hazelnuts to a bowl, and allow them to cool. When they can be handled, the next step is to remove the skins. - Place a lid or another bowl on top of the present bowl, and shake aggressively for 30 seconds. Repeat as necessary until all the skins have fallen off. In between shakes, separate the "naked" hazelnuts by putting them in the food processor. - Once you have all the hazelnut bare and in the food processor, grind them into a loose paste. This will take 2 to 5 minutes; scrape the sides often. - Next, add the remaining ingredients: powdered sugar, cocoa powder, hazelnut oil, vanilla extract and salt. Process until it is all completely married, and don't forget to scrape those sides again. About 2 minutes later, you will feel the mixture loosen, and it will get glossy. It's done! Transfer the goodness to an airtight or tight-lidded container, and enjoy this natural version of a yummy spread anytime over the course of a month. It can be stored in the fridge or in the cabinet. It's easy, and no chemicals needed! The finished product in the processor. Ready for dipping and/or spreading. Side by side comparison of spoonfuls. 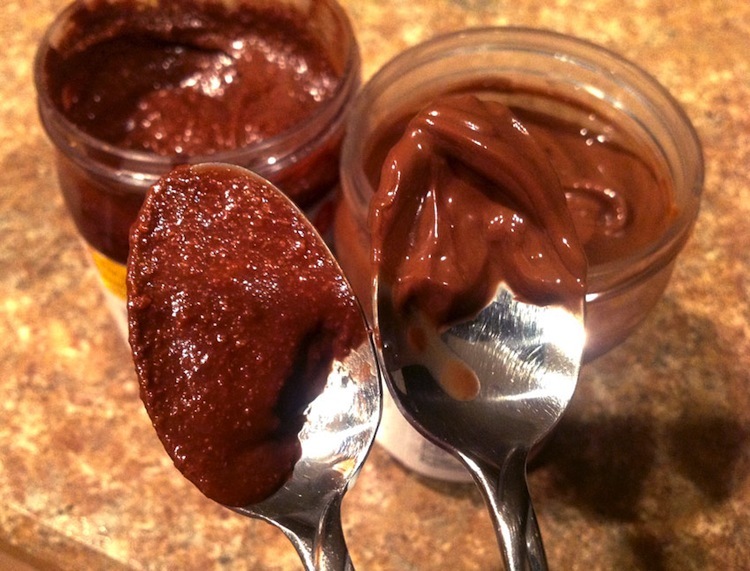 The nutella brand on the right looks oily compared to the homemade version of the left. The homemade is more hearty, but still tastes sweet, and is still easily spreadable. I used an old nutella container to house the homemade stuff on the left. I don't think I could ever look at the nutella brand the same... it just looks fake, and not a food. When reading the nutella label, the ingredients seem pretty simple, and right to the point. There aren't any crazy scientific formulas, or any words where you have to try to "sound it out." But as with most things on the shelf, it does contain some items that may screw you over. I don't have any resources to credit these claims, this is a snippet from Weed 'Em And Reap. Regardless if there is actual proof of these ingredients doing harm, doesn't it just logically make sense to eat fresh? I think it's more than worth the time. Soy lecithin -- Americans consume too much soy as a result of the amounts used in packaging. Too much soy can cause weight gain, thyroid depression, breast cancer, and accelerate existing cancer, just to name a few consequences. Sugar -- No brainer here, we all know this: too much sugar is bad. But what you may not know is the TYPE of sugar is even worse. Companies want the cheapest sugar, so they use a genetically-modified beet sugar that is actually a neurotoxin. No wonder everyone is a dumbass. Vanillin -- Speaking of neurotoxins, here is another ingredient that is found in A TON of products. Not to be confused with real vanillin that is the naturally-occurring compound found within the pods of the vanilla plant, and is responsible for the aroma and flavor of vanilla. That real stuff is way too hard to obtain (and thus expensive), so companies use SYNTHETIC vanillin. Also written as "artificial vanilla," or "vanilla favoring," this trickster is a by-product of the paper/wood pulp industries, or is made from a petrochemical precursor called guaiacol. Yum... petrochemicals (chemical products derived from petroleum). Sadly, it's very addicting. It causes your brain to release serotonin (“feel good” hormones) by bonding with receptors. That's why you're always craving your favorite vanillin snack. Palm Oil -- It's a healthy saturated fat (yay! ), but obtaining it hurts the orangutans (boo!). There are indeed sustainable ways to obtain palm oil. But which method do you think the companies are using? Skim Milk -- Another negative ingredient, that is due to method. Cows are fed hormones, antibiotics, GMOs, etc., which makes them sick and therefore, the milk has pus, blood, and potentially anything that the cow was exposed to or consumed. The milk is then pasteurized, goes through a homogenizer, and synthetic vitamins are added. It now looks and tastes like water, so to thicken up the batch, powdered milk is mixed in. Aaaannd, that's full oxidized cholesterol, only the most dangerous of all cholesterol. If you are a better researcher than me, and know of resources that make anything above factual, please send me link(s) or book title(s). I'll update this post with credentials as I obtain them.